Take the March Mayhem 2011 Quiz! Test your knowledge of what's happening in March Mayhem this year. The March Mayhem 2011 Developers Challenge is in full swing this year. Two rounds are down in the books, but there's so much action left to see. Favorites who've won for two years running are out of the running for good, while newcomers are busy slaying giants like Nintendo. 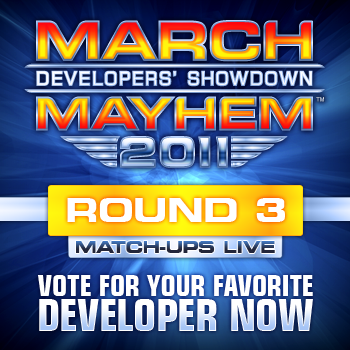 Which developer will reign supreme as the champion of March Mayhem 2011? Who will stand where so many others have fallen? We thought it'd be great to commemorate our annual contest with a little quiz testing both knowledge of the 64 developers in March Mayhem 2011, but also how they fared in March Mayhem's of years past. Take the March Mayhem 2011 Quiz now! Voting for round three of March Mayhem 2011 starts at 12 noon today, March 21st. There's only sixteen developers left so the competition is getting fierce. Go here to cast your vote for which developer reigns supreme.